Our W32 is a factory built boat and in every way, except for the pilot berth, is built per the build manual. In our boat, where the pilot berth should be, there is fixed bench seat with a shelf and 3 built in cabinets above. I’m considering rebuilding this section to include the pilot berth and the slide out bench. I’ve reviewed the build manual and can find the diagram, the part numbers and the plywood layout but can’t find any dimensions. If someone out there can direct me to the dimensions in the manual or can take actual measurements from their boat and pass them along, it would be appreciated. I don’t need the cabinets and feel a pilot berth is more useful for a cruising boat. I’ve attached a picture of our current buildout. 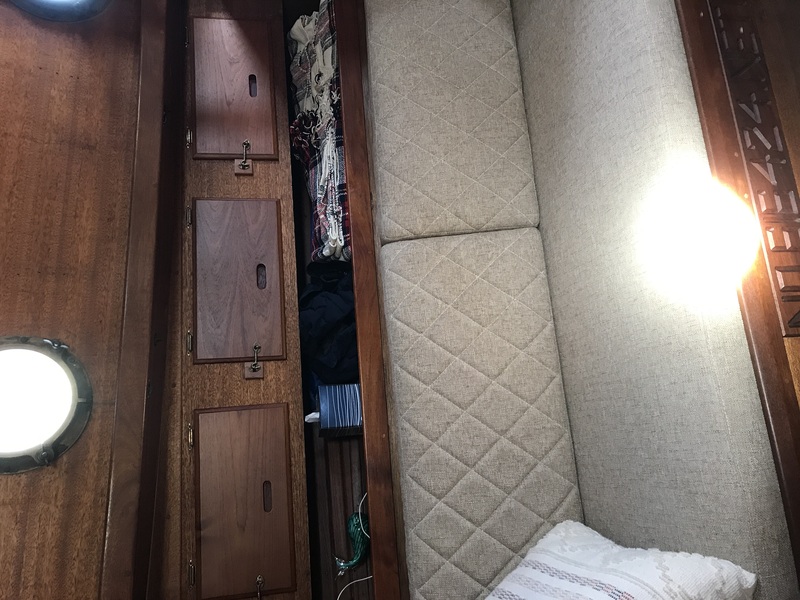 Building the sliding bench is pretty straight forward, what I need is width / depth of the berth at the forward bulkhead and width / depth at the hanging locker cabinet. Thanks for for any help I can get.